In June 2014 Parliament started debating a key change to the nation's pensions, the "Pension Schemes Bill". According to the Department of Works and Pensions' press release, "Public backing means full steam ahead for pension reforms". As it apparently already has your backing, dear fellow ripped-off Britons, we thought you should know more about what you are so keen on. The proposed legislation includes worrying provisions relating to independent trustees, indexation, and more. But for the purpose of this post, we shall focus on the "new" type of pension being introduced. Defined Benefit (DB): Where you are certain how much pension you will get, usually based as a percentage of your salary (final salary; career average; or whatever). Defined Contribution (DC): Where you only know how much pension you will get when you buy an annuity when you retire. 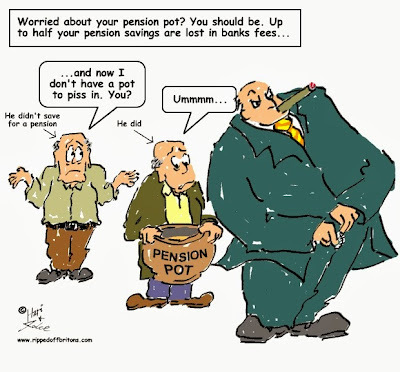 No Private Pension: Where your employer makes no contribution, and you depend on the state pension plus welfare and any other savings and investments you yourself may have. If you have a Defined Benefit pension the responsibility is on your employer to ensure there is enough money available in the pension fund to guarantee you will get the agreed percentage of your salary during retirement. This is risky for the employer, as the commitment is made when you start your job and only ends when you and your spouse drop dead. In contrast, with Defined Contribution the employer joins you in contributing to your pension pot. However when you retire it's up to you to use the pension pot, while the employer walks away unencumbered. It is said the Defined Benefit puts the risk on the employer, while Defined Contribution puts the risk on the employee. The new "Pensions Schemes Bill" comes up with a new "Shared Risk" pension. Now if you thought "Shared Risk" meant the employer and the employee sharing the risk, you'd be wrong. From the employer's point of view "Shared Risk" is the same as "Defined Contribution". Great for the employer, as it makes its cheaper contributions on a "pay and forget" basis just like for Defined Contribution. In reality, the only new thing about this new type of pension is its name. Ministers have experimented with various names hoping to disguise what it actually is: "Defined Ambition"; "Defined Aspiration"; "Shared Risk"; "Collective Defined Contribution". Whatever the name of this particular rose, the key thing is it is cheaper for the employer. The typical employer contribution to Defined Benefit is 15% of your salary, but for Defined Contribution it is less than 8%. And like Defined Contribution, if the pension pot doesn't grow as expected over time then that's not the employer's problem - it's yours. "Shared Risk" actually means you are sharing the risk with other employees, while the employer itself is off the hook. Not unlike a Group Personal Pension (except unrelated companies can be in the 'group'), which is another type of Defined Contribution pension. This basically means rather than being alone in a boat without a paddle, you are grouped in a canoe without any paddles. All this is not aimed at helping small employers. Showing sympathy for those who aren't strong enough to take the risk is not a priority. The reality is small companies already don't really provide Defined Benefit schemes. ONS figures for 2013 show for companies with up to 99 employees only 5% of staff are on Defined Benefit schemes. (For companies with 1 to 12 staff 90% of employees have no company pension; for companies with 13 to 99 staff 75% have no company pension). This change is for the benefit of large companies, employing over 1,000 staff. For these companies ONS figures show 45% of staff in 2013 were on Defined Benefit pensions. (As the graphs show, whatever size company you work for the lower your pay the less your employer cares about your retirement). This new legislation has played fast and loose with the word "Defined". Nothing is "Defined" in this new type of pension. The legislation is equally cavalier with the word "Promise". In a particularly risible manner Section 5 draws a distinction between a "full pensions promise" and a "pensions promise". (b) the level of the benefit is to be determined wholly by reference to that promise in all circumstances." "there is a “pensions promise” in relation to a retirement benefit if the scheme provides for there to be a promise, at a time before the benefit comes into payment, about the level of the benefit." What is the distinction? 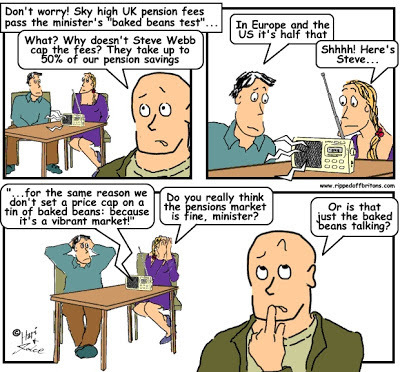 A "Full Pensions Promise" is a commitment made at the start of your employment. 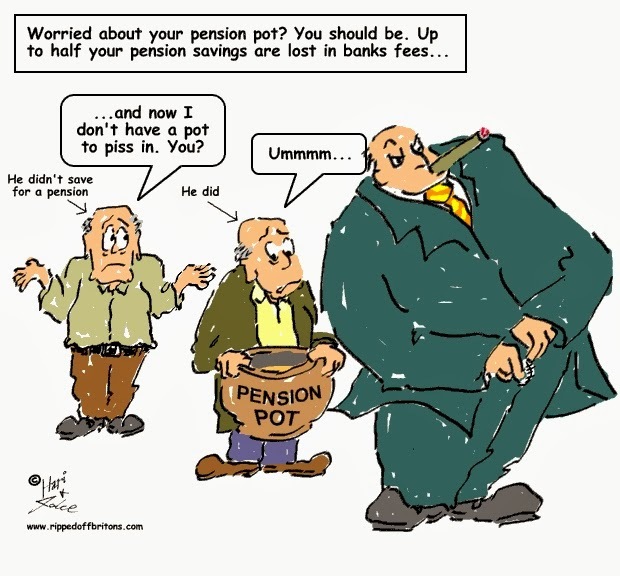 On the other hand a "Pensions Promise" can be made any time up to the moment before you retire - no different to buying an annuity with a Defined Contribution pension (which is already a mis-selling scandal in its own right). Britain is a rich country, getting richer. Britain is also unequal, getting more unequal. The share of GDP going to employees, in forms including salary and pensions, has fallen. This pension change means the employee share will get less. The DWP claims "Public backing means full steam ahead for pension reforms". Full steam maybe, but Public backing? Really?